It is appropriate to assess the 1980 Mariel Cuban migratory experience as we approach the 25 year-mark of these immigrant’s first arrival in the United States. Marielitos, as they are commonly known, have contributed greatly to the cultural and economic development of South Florida. Their contributions extend to the arts, literature, academic, and entrepreneurial domains. Yet, despite their many accomplishments, there is considerable research showing that during the period 1980-90, Marielitos experienced a different and more negative pattern of incorporation into U.S. society compared to earlier Cuban immigrants and post-Mariel Cubans admitted to the U.S. The evidence suggests that this experience was mediated by state policies in the United States and Cuba that contributed to higher levels of institutionalization and socio-economic marginality in the U.S. This paper assesses the extent to which the Marielitos’ experience is “different” twenty years after their arrival in the U.S. In this study, I use the 1% Public Use Microdata Sample of the person unit records from the U.S. Census 2000 to explore the impact of the “stigma” as pathological attached to the Mariel cohort and the extent to which it has continued to affect the experiences of post-Mariel Cuban immigrants. The study examines the mediating effect of gender, race, and class in the Mariel adaptation process. It explores the significance of the Mariel factor by comparing the experiences of pre-1980 arrivals with those of the Mariel cohort (1980-81) and post-Mariel arrivals (1982-90, 1990-2000). The central question of the study is the extent to which the Marielitos’ experience with stigmatization as pathological persisted, having a different effect on their adaptation to the U.S. from that of other Cuban arrivals before and after Mariel. STIGMA AND THE MARIEL EXPERIENCE IN THE U.S. The literature on stigma defines it as an “attribute that is deeply discrediting” that reduces the bearer “from a whole and usual person to a tainted, discounted one” (Goffman, 1963). The concept has been applied by sociologists, psychologists, and social psychologists to an enormous array of different circumstances—from schizophrenia to exotic dancing. This study proposes a definition that attends to important critiques, noting that much of the research and theory on stigma has an individualistic focus, viewing stigmas as something in the person rather than a designation that others affix to the person. This study conceptualizes stigma as a social and political process. It begins when dominant groups distinguish human differences—whether “real” or socially constructed. It continues if the observed difference is believed to connote unfavorable information about the designated persons. As this occurs, social labeling of the observed difference is achieved. Labeled persons are set apart in a distinct category that separates “us” from “them.” The culmination of the stigma process occurs when designated differences lead to various forms of disapproval, rejection, exclusion, and discrimination. The stigma process is contingent on access to social, economic, and political power that allows the identification of differentness, the construction of stereotypes, the labeling of persons as different, and the execution of disapproval and discrimination. This study relies on Goffman’s (1963) definition of stigma as a social identity, in which a dominant group(s) attribute an undesired differentness from what was anticipated to an out-group such that it leads to varieties of discrimination that reduce one’s life chances. Stigmatization is accompanied by the development of an ideology to explain the inferiority of the stigmatized and to account for the dangers the individual represents, sometimes rationalizing an animosity based on attributed differences such as those based on social class or race (Goffman, 1963). In social interactions between the stigmatized and the dominant society, the stigmatized are deprived of the respect and regard to which the person’s identity have led them to expect, leading to a phenomenon whereby the stigmatized echo the denial by selectively withdrawing from society and self-hatred, validating the stigma’s stereotypes and significantly affecting the relationship with the state and society. The Mariel Cubans differed in several significant respects in terms of their age, gender and race from the earlier migrations, factors which influenced the perception of the migration in the United States: there was a large number of males (almost 70%) and a large percentage of blacks (estimated at 25-40%) (Boswell, Rivera et al. 1980). The percent of nonwhite Marielitos more closely approximated that of the racial composition of Cubans, but they were distinctively more non-white than earlier migrants. The Marielitos were on average ten years younger than earlier Cuban immigrants. The Marielitos resembled the social and economic diversity of Cuba and did not differ significantly from the 1970s arrivals in their levels of education and employment histories. On balance, the migrants occupied a higher socioeconomic position than the average Cuban. Table 1 summarizes the principal occupation of the immigrants processed through the resettlement camps. It is the contention of this study that the stigma of the Marielitos as pathological, explored in more detail below, became identified with several observable attributes and attributed characteristics of the Mariel wave which were associated with the Mariel migration as a whole, but especially experienced by the younger, male, non-white, disabled Marielitos. 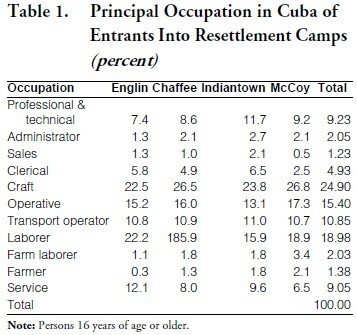 These attributes impacted the probability of being interned in a resettlement camp, the length of time spent in processing in camps, the likelihood of being categorized as a “troublemaker,” and the prospects for institutionalization by the state and discriminated by society as a whole and the Cuban ethnic enclave in particular (the enclave serves as a pathway to economic and social incorporation for Cuban migrants). The effect of these perceived negative attributes and characteristics are not mitigated by education, citizenship, English language proficiency or other experiences which would be expected to minimize the stigma of differentness. Studies of Mariel migration stress the different experience of the Marielitos’ incorporation in U.S. society from that of other Cuban refugees (Portes and Stepick, 1985; Portes and Zhou, 1993; Bach, Bach, and Triplett, 1982). Much of this literature has focused on the disparities between Marielitos’ socioeconomic incorporation and that of other Cuban immigrants. Early studies of the Mariel cohort by Portes, Clark, and Manning (1985), for example, found a more difficult period of early adaptation of Marielitos, marked by frequent bouts of forced unemployment, low-paid work, and dependence on welfare and charity. The most dramatic difference between the Mariel group and earlier arrivals found by Portes, Clark, and Manning (1985) refers to employment levels. After three years, the Marielitos’ male unemployment was more than twice that of Cuban refugees during the 1970s, while among women the unemployment rate was close to 60% higher. The study found that “twothirds of unemployed respondents were looking for work at the time of the survey. Hence the rate of involuntary unemployment … amounts to 27%, a figure three times greater than among the Cuban-born population in 1980” (Portes, Clark, and Manning, 1985). Significantly, the study found that single and younger respondents, as well as non-whites, were significantly less likely to be employed. The Marielitos, on the whole, had fewer family and social networks of support than earlier exiles, a condition that the authors found to be strongly correlated with occupational status and income in the new society. While the Mariel group’s educational attainment in Cuba was comparable to that of émigrés of the 1970s, their backgrounds did not provide an effective gateway into the U.S. labor market. Consequently, the Mariel Cubans have tended to concentrate in the informal labor market and self-employment, areas that are less well compensated. Mariel Cubans tended to express comparable levels of satisfaction with their new society when compared with the earlier Cuban immigrants, and voiced similar plans to acquire citizenship. Significantly, threefourths of those surveyed (Portes, Clark, and Manning, 1985) reported experiences with discrimination from the pre-1980 Cuban community. The authors noted that while Cubans are not the first immigrant group to suffer “fractures” of internal solidarity due to the arrival of a new wave of “different” arrivals, but concluded it was to be determined whether the Cuban community could effectively rise to the challenge of supporting, rather than hindering, the incorporation experience of the more recent newcomers. In sum, the authors concluded that the Marielitos’ adaptation to the U.S. was delayed by the attitudes and reactions of the Cuban enclave, and expected that if these attitudes could change, the Marielitos’ socio-economic incorporation would be accelerated. Subsequent studies of the Marielitos using 1990 Census data reported similar findings, although one school of thought emphasized the role of state policies in the delayed and uneven incorporation of the cohort. 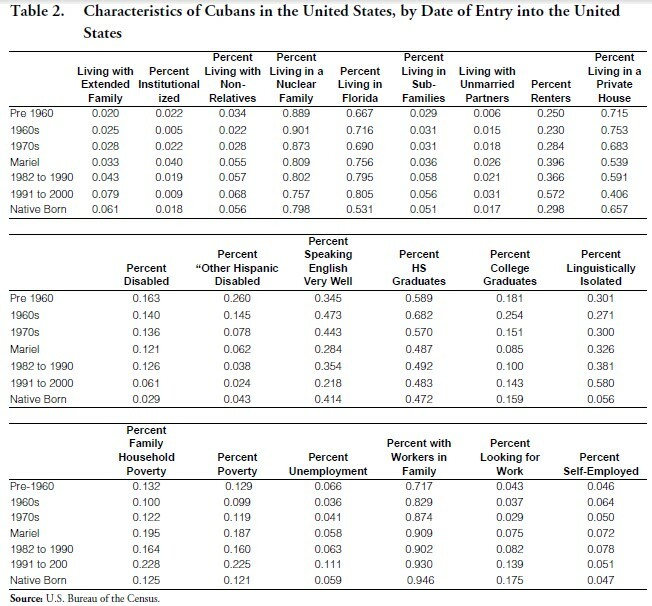 Aguirre, Saenz, and James (1997), in their study using the Public Use Microdata Sample of 50,958 Cuban origin persons, found the Marielitos’ incorporation in U.S. society significantly different from that of other Cuban immigrant cohorts (pre- Mariel and post-Mariel Cuban immigrants). They found a pattern of adaptation among the Mariel cohort that included higher proportions living in more unstable household arrangements (for example, higher proportions living with non-relatives and in households with subfamilies) and a higher percent (3.4%) were institutionalized 10 years after their arrival. Furthermore, the Mariel cohort, on average, had a lower command of the English language, lower rates of high school and college completion; they were far more likely to be unemployed (11.2% compared with 7% for the 1970s cohort and 4.7% for the 1960s cohort), looking for work (21.3% compared with 11% for the 1970s cohort and 8.6% for the 1960s cohort), and living in poverty (26.9% compared with 16% for the 1970s cohort and 10.7% for the 1960s cohort) than other cohorts and those employed were more had on average lower personal earnings. Median household incomes for Mariel immigrants were on average lower than the pre-1980 cohorts. Aguirre, Saenz, and James (1997) found the Mariel stigma persisting in the higher levels of institutionalization of the cohort, with being a “Marielito” increasing the rate of institutionalization more than twice, all other relevant factors (age, gender, education, marital status, etc.) being equal.1 The authors concluded that the “virulence” of the Mariel status (“stigma”) increased the probability of institutionalization, and disadvantaged the group in their overall incorporation in U.S. society. These findings suggested that a decade after the Portes, Clark, and Manning (1985) study, the Mariel stigma and the “moral epidemic” associated with the Marielitos’ presumed differentness from society and from other Cuban immigrants, had a lasting “generalized negative impact.” The evidence suggested that in addition to the “social fracture” thesis, state policies targeted the Marielitos in ways that disproportionately led to their higher rates of institutionalization. This analysis was substantiated by other studies on the treatment of the Mariel cohort by the criminal justice system. 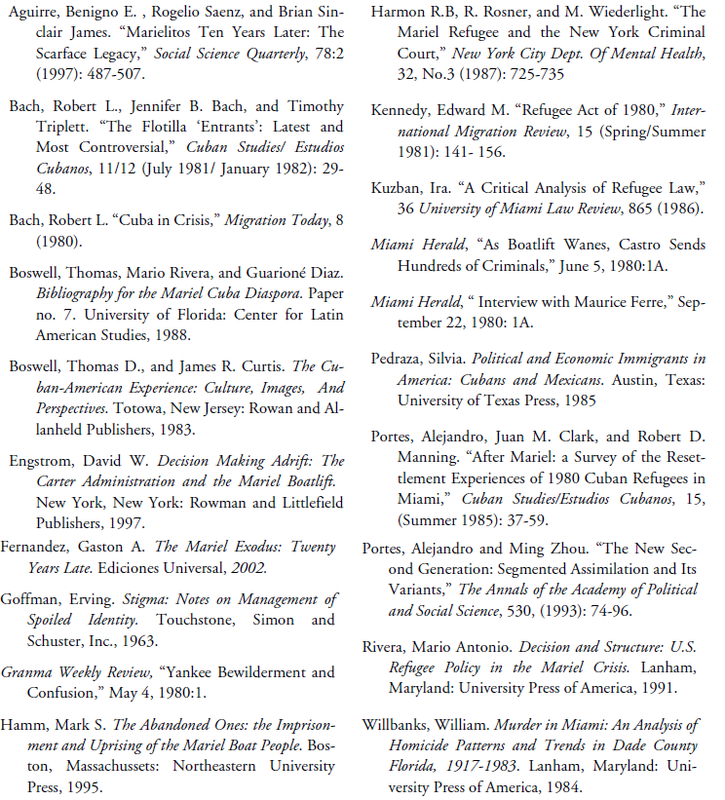 Data presented by Harmon, Rosner, and Wiederlight (1987) suggest that some of the Cubans “had lengthy histories of psychiatric treatment in Cuba, including contacts which began as early as childhood and adolescence, attempted suicides, and hospitalization with electroconvulsive therapy.” The mentally ill charged with criminal conduct (which ranged from attempted murder to public lewdness, petty larceny, and possession of a weapon) received unusually severe penalties, supporting the “moral entrepreneur” hypothesis. While there is little doubt that the Cuban regime sought to “poison” the image of the migrants by deporting mentally ill Cubans, the authors conclude that, for their sample of 54, the experience at arrival in the United States with “physical hardship, emotional tension, economic difficulties, and restriction of freedoms” encouraged the reversion to such behaviors and that their institutionalization rates exceeded those of similar non-Mariel cases (Harmon, Rosner, and Wienlight, 1987). A great deal of attention has been given in the media to the involvement in homicides (as victims and offenders) of the Cuban Mariel refugees. At least 42 homicide victims in 1980 were from the Mariel Boatlift. Since the refugees were only in Dade County half of 1980, their victimization rate would be approximately 84 per 1000, a rate approximately equal to that for blacks in the county. And if one controlled for the disproportionate number of males and young adults, the rate would be below that of blacks in Dade County. Calculations suggest that the Marielitos were responsible for only 25% of the 60% increase in homicide victimization (Willbanks, 1984). The arrival of the Marielitos, coincident with an increase in criminal behavior attributed to Hispanics in South Florida, provided a context favorable to stigma formation and the labeling of the Marielitos as pathological. Has the Mariel stigma factor endured into the 1990s and has this factor been amplified? The Marielito experience in the U.S. was unique in the transference of a stigma of “undesirables” and “delinquents” that originated in Cuba to the United States (Aguirre, Saenz, and James, 1997; Fernandez, 2003). The Mariel stigma can be traced to a confluence of factors in Cuba and the United States: (1) the large number of young non-White, males, most likely to be stigmatized in U.S. society as criminal and undesirable; (2) the arrival of the Marielitos coinciding with a wave of crime in South Florida related to drug related gangs, of Hispanic origin, that was unfairly categorized by the media as “Mariel related” (Willbanks 1984); and, (3) state policies in Cuba and the U.S. deliberately amplifying public fears of the immigrants that subsequently targeted the Marielitos for differential treatment. The Mariel stigma was based on social prejudices about the physical attributes and character traits of the group, which were associated with discredited categories in Cuba and the U.S.: criminality, mental handicaps and other disabilities, homosexuality, prostitution, drug addiction, and radical political behavior. The ideological rationalization of Marielitos as pathological in Cuba was deliberately amplified by the Cuban government’s introduction of a small number of criminal elements into the exodus, in an effort to discredit the entire wave of immigrants and to score propaganda points. No one knows for certain the exact number of prisoners and ex-prisoners included in the Boatlift, although eyewitness reports and Marielitos’ own statements confirm that hardened criminals were forced to join the Boatlift under threat of extended prison sentences. Official INS figures identified 1,306 “aliens” as having questionable backgrounds (Hamm, 1995). Scholars who have researched the criminal backgrounds of Marielitos have found that even among those identified as “hardened criminals,” a significant number were in prison in Cuba for committing minor thefts in the island and for committing desperate acts of rebellion. Official USG figures presented to the United Nations are consistent with INS estimates. These estimates relied on the confessions and accusations of the Marielitos, since Cuban authorities refused to share legal and medical documents. Similarly, the number of prisoners charged with petty crimes who “chose” to join the migration is uncertain. Up to 85% of the Marielitos did not have any prison records in Cuba, and the majority with prison records was incarcerated for minor crimes, which would not be considered crimes in the United States, such as selling goods in the “black market” (Bach, 1980). Despite these figures, the pathological stereotype was successfully exported to the U.S. where it became magnified by the reception in America. The stigma ideology in Cuba stressed the inferior character of the Marielitos and the danger they posed to Cuba was evident in President Castro’ speech stating that “we also have our own delinquents (drug addicts, prostitutes, gamblers, and all of that). Well, we used to. We have reduced those a bit … the housecleaning has been considerable, people of Las Tunas know this perfectly well” (Granma Weekly Review, 1980). Castro makes reference to the infiltration of criminals into the migration, stating that some were “given the alternative of leaving prison, of being released and of traveling into Yankee paradise” or remaining in prison. In the same speech, he categorizes those who were given the option as being “thieves of chickens, sheep, hogs and other things, prostitutes, gamblers and drug users.” The Cuban government emphasized that only petty criminals had the “choice” of leaving Cuba. According to the official line, those who were guilty of committing violent crimes, “deeds of blood,” and the mentally ill were not “intentionally” included in the exodus (Granma Weekly Review, 1980). This arrival context set the stage for the stigmatization of Marielitos. Research on stigmatization of Marielitos suggests that the rationalization of Marielitos’ negative differentness was promulgated by bureaucracies in the U.S. that benefited politically from the public anger towards the immigrants (Hamm, 1995). The groups’ attributes and characteristics clearly represented differences that were perceived as different and undesirable in the U.S.,: the large number of young single males, non-whites, with few social ties in the U.S., and an unknown number of former criminals in Cuba, all created a perception of departure from the previous norm of Cuban migration. As in Cuba, the state and media played a dominant role in the development of an ideology to explain the inferiority of the Mariel group, and the danger it represented, rationalizing the stigma in terms of criminality and deviance. Bureaucratic interests maximized their own political support by exaggerating the Marielitos’ negative stereotypes. The INS and other agencies pursued measures calculated to reinforce public fears of the Marielitos, and to use this as a means to gain public support for increased law enforcement budgets and for tough treatment of immigrants. The INS capitalized on this status in the political arena to further enhance its own importance. In terms of public exposure and political recognition, it is in fact safe to conclude that the Marielitos were the best thing that ever happened to the INS. Before the Freedom Flotilla, the INS was a relatively obscure subdivision of the Justice Department that operated on a yearly budget of roughly $900 million. In 1983, the INS broke the billion-dollar mark with a budget of $1.07 billion. Then came the moral crusade and with it the most exorbitant budgets in the history of the INS, more than 100% increase in six years (Hamm, 1995). The extent of danger to society posed by the Marielitos received significant dissemination in news accounts. For example, the Miami Herald estimated that as many as 23,000 brought “experiences from Castro’s jails,” implying that, unlike previous “political prisoners” considered assets to the U.S., these posed a threat. The Herald reported that “the homicide rate in Miami jumped 66% the year of the Flotilla. The following year, the Marielitos accounted for 27% of Miami’s 226 murder victims. One-third of those arrested and charged with murder in 1981 arrived via Mariel” (Miami Herald, June 5, 1980:1a). Political entrepreneurs furthered the labeling of the Marielitos. In South Florida, politicians blamed rising levels of crime in the area on the Marielitos. On September 22, 1980, Miami mayor, Maurice Ferre, for example, cited Dade County police statistics as showing a major increase in crime as a result of the Mariel immigrants,”forcing the county to request aid of federal sources to confront the dramatic increase in crime.” According to the mayor, the arrival of the Marielitos had caused increases of 774% in larcenies, 190% in armed robberies, and 109% in violent crimes against persons in Little Havana (Miami Herald, September 22, 1980 1:A). Similarly, Fort Smith Mayor Jack Freeze, was quoted in the Arkansas Gazette on May 9, 1980, as saying that he did not think that the Cubans would be well received “because of the unknown quality of these people.” He added that stories in the press had “led us to believe these people are undesirable types.” Sounding a deep note of alarm, Senator Dale Bumpers was quoted in the Gazette on June 4, 1980, stating that the current U.S. immigration policy threatened “to disrupt our whole democratic process.” These comments contributed to the fearful climate among residents of the Ft. Smith area. Thus, federal ambivalence towards the Mariel cohort, insufficient federal funding for the entrants, and the electoral climate, created a context in which local and state political entrepreneurs assumed control in defining the social identity of the Marielitos and providing a rationalization for their stigma, using attributes such as criminality, homosexuality, and deviance as code words for the racial, gender, and age characteristics of the Marielitos. Twenty years after their arrival, has the Mariel cohort’s experience with incorporation into U.S. society continued the pattern of 1980s with comparably high rates of social and economic marginality and high rates of institutionalization? The data from the 2000 census shows some significant continuities as well as changes in the Mariel cohort’s adaptation. As expected, Table 2 shows that the Marielito cohort in comparison to other cohorts is younger, with a mean age of 46 in 2000. They are younger than pre-Mariel arrivals, but older than the 1980-90 cohort (mean age of 41) and the 1990-2000 cohort (mean age 35). The proportion of non-White Marielitos is greater than for all other groups (18% non-White), in comparison to the 1960s cohort (6.4%), the 1970s cohort (9.9%), the 1982-90 cohort (12.1%), and the 1991-2000 cohort (11.7%). The proportion of married Marielitos is lower (53.5%) than the 1960s cohort (65%) and the 1970s cohort (62%). Marielito married rates, however, are only slightly lower than the 1982-90 cohort’s corresponding proportion (54.3%), and are considerably higher than the 1991-2000 cohort’s rate of marriage (46.9%). The overall trend among Cuban immigrants is to settle in Florida. Despite the resettlement efforts of the Federal government, the proportion of Marielitos living in Florida is 75.6%, higher than the pre-1980 cohorts (71.6% for the 1960s cohort and 69% for the 1970s cohort), but lower than the 1982-90 cohort (79.5%) and the 1990-2000 cohort (80%), suggesting the settlement pattern (first arrivals entering into the larger society through the Miami enclave) is not unique to the Marielitos. Compared to other cohorts, except of the most recently arrived 1990-2000 cohort, the Marielitos are more likely to rent housing (39.6%). In 2000, the proportion of Marielitos living in nuclear families (81%) was lower than for the 1960s cohort (90.1%) and the 1970s cohort (87.3%), but similar to the 1982-90 cohort (80.7%) and above the 1991-2000 cohort (75.7%). Aguirre et al.’s (1997) findings based on the 1990 census that the Marielitos were forced to adopt survival living strategies at higher rates, such as living in extended families and subfamilies as well as with non-relatives, do not appear as a uniquely Marielito pattern a decade later, suggesting that Mariel cohort living adjustment resembled the pattern of other cohorts. Significantly, however, a much larger proportion of Marielitos remained institutionalized in 2000, suggesting the lasting consequences of the arrival stigma. By 2000, the Marielitos lagged in their language and educational attainment compared to other cohorts. Only 28.4% reported speaking English very well, little unchanged from what they reported in 1990. This rate of English proficiency lagged the 1960s cohort (47.3%), the 1970s cohort (44.3%), the 1982-89 cohort (35.4%), and the Native Born (41.4%). Significantly, while the proportion of Marielitos reporting high level of language proficiency stagnated, the 1982-90 group reported significant gains in proficiency (from 21.6% in 1990 to 35.4% in 2000). The proportion of Mariel high school graduates (48.7%) lagged behind the 1960s cohort (68.2%) and the 1970’s cohort (57%). However, it was comparable to the 1982-90 cohort (49.2%), the 1991-2000 cohort (48.3%), and the Native Born (47.2%). The college graduation rates reported in Table 2, however, are lower for the Marielitos when compared to all cohorts. The Mariel cohort’s economic incorporation also is different and lags behind other cohorts. The cohort’s rate of unemployment in 2000 (Table 2) was 5.8%, and compares unfavorably with the 1960s (3.6%) and 1970s (4.1%) cohorts, is similar to the 1982-90 cohort (6.2%) and the Native Born cohort (5.9%), and much lower than for the 1991-2000 cohort (11.1%). Marielitos’ median personal earnings ($20,414) is lower than for the 1960’s cohort ($36,095), the 1970’s cohort ($25,103) and Native Born ($25,153) but higher than the 1982-90 cohort ($18,960) and the 1991-2000 cohort ($14,381). Table 2 shows Marielitos below the poverty line at 18.7%, nearly twice the rate of the 1960s cohort (9.9%) and the 1970s cohort (11.1%) and Native Born (12.1%). It is higher that that of the 1982-90 cohort (16.4%); only the 1991-2000 cohort is below it (22.5%). The percent of family households living in poverty shows similar results, with 19.5% of Marielito families in this category, following the pattern reported in personal earnings. Finally, indications are that the Marielitos are naturalizing at similar rates to other Cuban cohorts and Hispanics. Fifty percent of the Mariel cohort reported being naturalized citizens, compared with 89.5% for the 1960s cohort, 80.5% for the 1970s cohort, 42% for the 1982-90 cohort, and 11.2% for the 1991-2000 cohorts. Their relationship with the state, as indicated by naturalization rates, appears to fit the pattern for Cuban cohorts. The main difference in the cohorts’ relationship to the state appears to be in the unusually high rates of institutionalization of the Mariel cohort. The stigma in the U.S. attached to the Marielitos as different appear to have an on-going effect on Mariel adaptation experiences in the U.S., despite their personal and collective struggles to wash out the effects of stigma in U.S. society. This supports the thesis that the attribution of an undesired differentness to a group and not just individuals can lead to varieties of discrimination that reduce one’s life chances. The evidence further supports the contention that stigmatization is accompanied by, and promulgated through, the development of an ideology to explain the inferiority of the stigmatized and to account for the dangers the individual represents, sometimes rationalizing an animosity based on attributed differences, such as those based on social class or race (Goffman, 1963). The effects of stigmatization are tested further below with regression models which will examine the effects of predictors of stigma most likely to impact young, non-white, males, disabled Marielitos with lower levels of education on (1) personal earnings and (2) rates of institutionalization. The prediction is that the Mariel stigma factor should increase the odds of lower earnings and increased rate of institutionalization, all other factors being equal. The effects of the stigma of differentness should be most pronounced among Marielitos who are males, non-white, younger, and disabled, but should be evidenced in the Mariel group as a whole independent of factors that would be expected to mitigate the attributed negative differentness, such as education, marital status, age, proficiency in English, and naturalization status. The expectation is that male, white, more educated, married, older, and able will raise the odds of increasing personal income and lower rates of institutionalization for all cohorts except for the Mariel cohort: the Mariel stigma factor should significantly lower the odds of average higher personal income and increase the prospects for institutionalization. A disturbing finding of this study is that the decade of the 1990s saw the persistence in unexpectedly high rates of Mariel institutionalization. The factors that would be predicted to lower the probability of institutionalization, such as education, marriage, white Cuban, gender, and naturalization, are offset by being a Marielito immigrant. In 2000, 4% of the Mariel cohort (398 out of 10,000) remained institutionalized, a rate three times higher than the other cohorts combined (1.3% or 138 per 10,000). Looking at the conditional probability of institutionalization, none of the expected factors—with the exception of citizenship—lowers the odds of Marielito institutionalization. Race: The rate at which white non-Marielito Cubans are institutionalized is 106 per 10,000, compared to 255 for white Marielitos, and 1050 for non-white Marielitos. Gender: Cuban women are less likely to be institutionalized than males. The rate of women’s institutionalization for all cohorts is 75 per 10,000. The rate for Marielito women’s institutionalization is 89 (probably due to the fewer women sent to the detention camps where the most virulent stigmatization occurred). The rate for Marielito males is 589. Marital Status: For all cohorts, marriage lowers the rate of institutionalization, with 117 per 10,000 for married Cuban and 195 for unmarried Cubans. The rate for married non-Mariel Cubans is 101, while for married Mariel Cubans it is 280. The rate for unmarried Marielitos is 535 compared to 170 for non-married, non-Mariel. Education: High school completion lowers the odds of institutionalization, with non-Marielitos with a high school education or higher being institutionalized at a rate of 113 per 10,000. Marielitos with greater than high school education are institutionalized at a rate of 279, and Marielitos without high school education at a rate of 511. English language: Non-Marielitos with low language proficiency are institutionalized at a rate of 138 per 10,000 compared to 454 for Marielitos similarly proficient. Self-assessing as highly proficient does not wash out the effects of “Mariel.” Non- Marielitos who rate themselves as highly proficient are institutionalized at a rate of 137 compared to 264 for the Mariel cohort. U.S Citizenship: Citizenship’s effect on the Cuban cohorts has changed since the 1990 census, showing a lowering of the stigma with citizenship. Non-Mariel and Marielito citizens are institutionalized at approximately the same rate (127 to 110 per 10,000). However, the effect of the Mariel factor on non-citizens is marked with a non-Mariel, non-citizens’ institutionalization rate of 172, compared to 702 for Marielito non-citizens. Disability: The rate of institutionalization for disabled non-Marielitos is 561 per 10,000, but it is 837 for Marielitos (probably reflecting the higher numbers of Marielito arrivals without social ties in the Cuban ethnic enclave) and 338 for non-disabled Marielitos. The interaction of factors such as race, gender, education, and language ability with institutionalization shows the significant influence of the “Mariel” stigma on institutionalization rates. This evidence supports the thesis of the continued influence of the “moral epidemic” on this cohort. To further test the influence of the Mariel factor on institutionalization, I ran Model 1 as a regression analysis of the independent variables (x1=years since immigration; x2=number of non-White Cuban immigrants; x3=gender; and x4=“Mariel” dummy variable) on the dependent variable (y=number of institutionalized Cubans). A more inclusive model that introduced the number of non-high school graduates, number of immigrants with low English language proficiency, and disability did not find these variables to increase the explanatory value of Model 1. Although some of the independent variables are highly correlated with each other and the dependent variable (since they vary in absolute terms according to the total number of Cuban immigrants in a given year), this model still accounts for more of the variation in institutionalization rates than other similar indicators that are expected to have an effect on institutionalization, such as “Total Cuban Immigrants” or “Total Cuban Immigrants Speaking English Very Well.” Further statistical analysis should shed more light on these relationships. Years since immigration and the number of non- White immigrants have a positive effect on the number of institutionalized Cubans (B1=4.874 and B2=.125). For the Mariel variable (x3), the effect was also positive (B3= 2392). All are significant above the P <.05 level. While the coefficient for number of male immigrants is negative (-0.0137), it is not significant (the standard error is 0.0112). The R2= .9062. This suggests that the three variables, Years Since Immigration, Race, and “Mariel,” explain much of the variation in the institutionalization rates. The Mariel factor is sufficiently robust to account for an additional 2,392 institutionalized after accounting for years since immigration, race, and gender. This finding supports the stigma hypothesis. Model 2 tested the influence of the same variables minus “Mariel” on institutionalization, and found an R2=.8213. The Beta coefficient for years since immigration was positive (B1=1.99); however it was not significant. The Beta coefficient for non-White was strongly positive (B2=.313) and the SE=.054 significant at the P<.01). Model 2 suggests an alternative interpretation to the stigma hypothesis, suggesting the strong influence of race (non-White) on institutionalization. Model 1 is stronger in its explanatory power but not overwhelmingly so due to the correlation between race and institutionalization. Twenty years later, many Marielitos have successful adapted to the U.S. and have contributed to the arts, business, society and education. Many Marielitos have overcome the stigma of the migrants and have disproved the negative stereotypes. Despite this, for many others, the costs of the stigmatization remain very high and adaptation elusive in the face of depression, incarceration and economic hardship. Levels of unemployment and reported discrimination by others, including other Cuban-Americans, are high. Time will likely obliterate the worst of the Mariel stigma but in the meantime, the human costs of a highly politicized migration demand that states desist from using innocent people as instruments of conflict. This study shows the utility of Goffman’s concept of stigma to the study of larger social groups and their interactions with the larger society. The Mariel case demonstrates the importance of political power and the pivotal role of the state and media in defining the social identity of immigrant groups affecting the overall context for their social incorporation. It further suggests the important role that political entrepreneurs play in rationalization of stigma, and the importance of asymmetrical power relations between the dominant groups in society and newly-arrived immigrants in defining the social identity of the newcomers. Twenty years after their arrival, the Marielitos’ stigmatization continues to exact a cost in their adaptation to the U.S. Further research is necessary on the processes and mechanisms both bureaucratic and political, especially in the criminal justice system that continue to disadvantage the Marielitos in their treatment by state institutions. For civilized nations, the Mariel experience and its aftermath should serve as a wake up call concerning the need to depoliticize migrations and to deal with the human and social costs of immigration free from racial, ethnic, or ideological stereotypes. 1. The institutionalized population includes people under formally authorized, supervised care or custody in institutions at the time of enumeration; such as correctional institutions, nursing homes, and juvenile institutions.